Remove it at anytime, Stick it to anywhere & Holds anything. You will discover more useful using way of the vokoly gel pad from your life. How do I remove the gel pads? It is as easy as taking an edge and gently peeling it off. What is the lifespan of a gel pad? 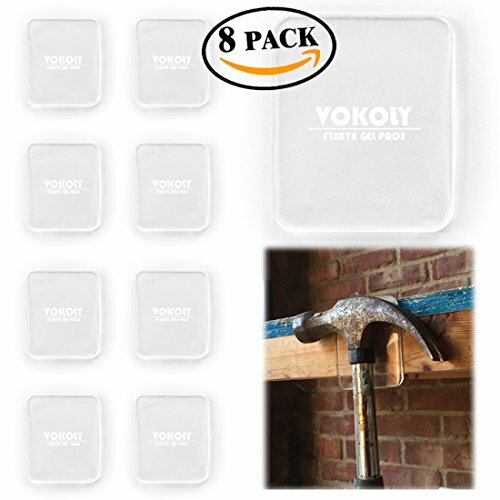 Due to the properties of vokoly gel pads, it is reusable until you no longer need it. Just remember to rinse with warm water and air dry between applications. Vokoly provide 1 year Non-artificial damage warranty. Portable - Easy to carry wherever you go. Easy to use and widely used - Fixed the things directly to where you want. Stick or remove in seconds.It can stick the phone, pad, camera, key, water cup and many other things, stick to glass, mirrors, whiteboards, metal, kitchen cabinets, tile, car, etc. High quality fixate GEL pads - Durable, strong stickiness, strong plasticity, flexible use.Can be fixed on almost all smooth surfaces. Reusable and washable - Dust and dirt will reduce its stickiness, it needs to be cleaned with water. Warranty - Vokoly provide 1 year Non-artificial damage warranty. If you have any questions about this product by VOKOLY, contact us by completing and submitting the form below. If you are looking for a specif part number, please include it with your message.